Although the New Zealand cricket season may be winding down, next seasons preparations are already underway in the Canterbury Cricket offices, with discussions around uniform being the first on the agenda. After a successful five years wearing purple and gold in the Super Smash Twenty20 competition, both Canterbury Men and Women’s teams will adopt the royal colours across all formats beginning October 2019. 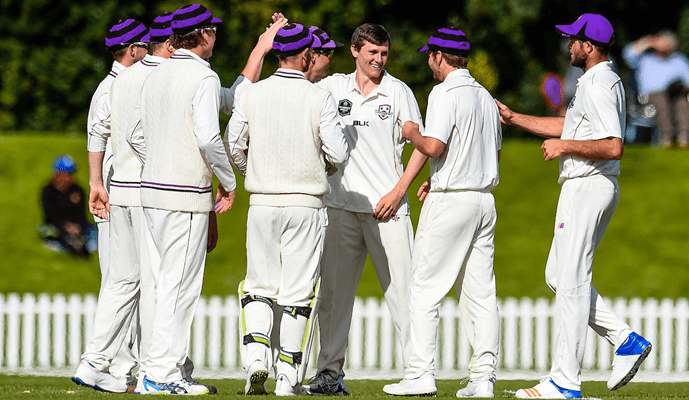 The Plunket Shield strip will retain the same design to match the New Zealand cricket first class uniform guidelines, but the red will be replaced with purple accents as seen in the above image. The Men’s Ford Trophy and Women’s Hallyburton Johnstone Shield kits will also see significant changes, with designs currently being drafted – set to be released in the coming weeks. Players and staff were told of the changes last week and Canterbury Cricket CEO Jez Curwin said it was met with “support and excitement”. “After working with our consultant ‘Essa Rubich’, we found the purple and gold colours have been received well by our fans, in particular our younger audience who are the future of the game. The colours represent strength and nobility and we think the design is modern and relevant for the people of Canterbury”. We look forward to next season seeing both men and women wear the Canterbury purple with pride.